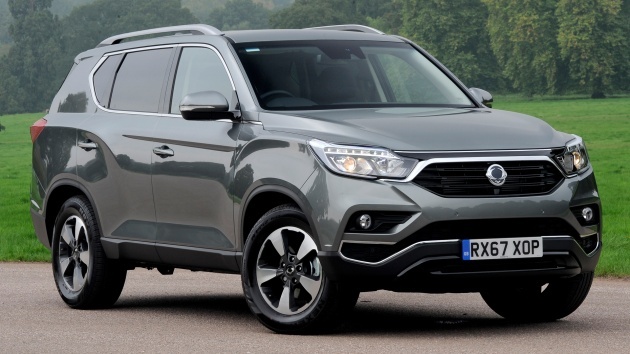 The 2018 SsangYong Rexton first broke cover earlier this year with a completely new look as part of the company’s efforts in renewing brand identity. It’s also SsangYong’s flagship seven-seater model, slotting above the Tivoli and upcoming Korando, which will also be a seven-seater model. The Korean-made SUV is powered by a 2.2 litre turbodiesel engine (e-XDi220) that’s developed in-house, producing 181 PS and 420 Nm of torque. This is paired to either a six-speed manual or seven-speed automatic transmission (the latter sourced from Mercedes-Benz), and a rear-biased all-wheel drive system. SsangYong claims that the Rexton has best-in-class for approach and departure angles of 20.5 degrees and 22 degrees respectively. In terms of suspension, the front receives double wishbones whereas the rear settles for a 10-link independent suspension. It weighs between 2,095 kg to 2,233 kg depending on trim levels and has a towing capacity of 3.5 tonnes. The cabin on the other hand, appears to be rather premium, especially with the quilted Nappa leather upholstery seen on the upper section of the seats, door cards and lower dash. It comes with either a 8.0-inch or 9.2-inch touchscreen, both supporting Apple CarPlay and Android Auto with mirroring function as well as reverse camera. As for equipment, the range-topper (Rexton Ultimate) comes with 20-inch alloy wheels, HID headlamps, LED fog lamps with cornering function, interior mood lighting, three-dimensional around-view monitoring, lane change assist, blind-spot detection, rear-cross traffic alert, heated and ventilated seats and a ‘smart’ electronic tailgate. Prices in the UK start from £27,500 (RM154k) to £37,500 (RM210k) for the full-spec Rexton Ultimate. Liking what you see here, guys? Do you think SsangYong Malaysia should make a comeback with this? Comment below! No need comeback. Last time SsangYong laku cause they use Mercedes engine. that is why Malaysians bought it. Now use their own engine. Who will buy? It is like a human face got blow by a high pressure air!! No SUV hoo-ha. Yet SsangYong so powah. Parents bought a rexton back 10+ years ago. Wow, I didn’t know a car can break down that much times. Yeah, that pretty much sums up the ownership experience of most Ssangyong owners. People were attracted to the whole ‘budget Mercedes’ shtick back then. But expensive maintenance and poor reliability tanked RV. Most owners felt better to just drive their Ssangyongs until they are not worth it to repair anymore. Yeah. Brand new 180k 2004, now used unit only fetch 3k. Doesn’t have that aggressive look of the older version. The interior is nice, finally, they got it right, but that rear design – Oh My … !! A shade of Kia Sorento !!??? Design is Ssang Yong’s weakest point. The first generation Rexton looked way much better & macho than the following models. Who’s the designer huh? They first need to get rid of him & hire someone who can design decent looking cars for them..lol !! Why talk about comeback when there’s not even a proper service centre now. Can’t even get spare parts for our present models. Parts easily and available. Specialist workshop also got few in klang valley. I also did ssangyong cars..
Parts can easily be found in the shop at jln ipoh and sea park. A good work that charge reason in glenmarie and good injector service workshop in puchong at very good price too. Just changed bushes at 160k km. Cheap to maintain.